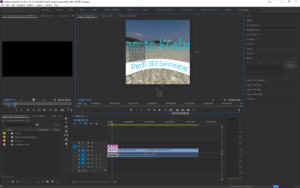 As you might already have heard, Adobe has it’s own 360 Immersive toolsets with Skybox. But there are some other VR Tools sets that are quite good from Boris FX. Continuum, known as The Swiss Army Knife of Plugins features the VR Unit. Five very powerful VR Plugins in one unit. 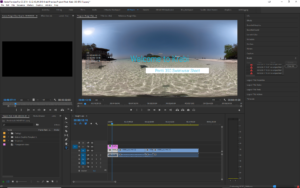 And for those of you in Avid World, they bring 360 workflows to Avid Media Composer. Here is the full list of host that support Boris Continuum VR Unit. For graphics cards, it is recommended that you run the latest graphics card driver version supported by your host application. A graphics card with a minimum of 1GB of RAM is required; 2GB of RAM is recommended. Let’s take a look at how to use each one of these valuable VR Tools. VR Insert allows users to easily insert a secondary source clip, title, logo, etc. into a 360/VR shot in true 360/VR space in either mono or stereo format in addition to providing a full array of controls to reorient the source in 360/VR space. When we first place one of these elements into a 360 spherical space, the result is a 2D flat object in a spherical format. The sizing is just not right, and if you look at it in an HMD, it is obvious. By applying the VR Insert tool and selecting the appropriate settings. There are a few things to keep in mind here. First, when you apply the VR Insert, you need to select which layer the item is on that you are applying the effect to. Second, in the Insert Apply mode be sure to select Replace instead of normal. If not, you’ll the corrected spherical tile and the original showing at the same time. Using the Insert Group, you can control various aspects of the title position, scale, opacity, etc. of the clip that is being inserted into the filtered 360 VR shot. Insert Distance: Use this to control the position of the insert along the Z-axis. Insert X Orientation: Use this to angle the insert along the X-axis (spin). Insert Y Orientation: Use this to angle the insert along the Y-axis (tumble). Insert Order: Controls, whether the clip is inserted before or after the Reorient operations, are applied, thus controlling whether the inserted clip maintains its current position in relation to the filtered source as you apply Reorientation. Before Reorient – The insert is composited before the Reorient, so the insert is affected by Reorientatioin. After Reorient – The insert is composited after the Reorient, so the insert does not move in response to Reorientation. Additionally, in the Reorient and Overlays modes, you can adjust the Orientation and the effect of the Overlay parameters. As you can see this is an immensely powerful effect. This is an indispensable tool for me. I live most of the time in Asia and 50HZ power land but shoot at 30 or 60fps. When working with native 50Hz lighting sources, the result is a very nasty flicker from the lights. VR Flicker Fixer reduces or eliminates flicker from the live action 360/VR source footage, providing 3 different methods for removing flicker. Apply the Frame Analysis method on clips with uniform flickering throughout the frame – e.g., a flicker that is caused by unintended shutter speed or aperture variations from frame to frame. Apply the two Temporal Smoothing methods on clips where flicker varies from pixel to pixel within the frame – e.g., a scene that is lit partly by natural light and partly by flickering artificial light. The compare tool is especially helpful to see the before and after results right away. Also, you can use the Limit Sampling controls to isolate the analysis phase to just a sub-portion of the image. Furthermore, you can use the Mask and key controls to isolate non‐flickering part of the clip and prevent the average flicker correction from being added. 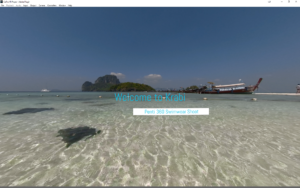 I could not get by without this tool, VR Reorient enables users to reorient a 360/VR shot in true 360/VR space in either mono or stereo format. This enables you to place the 360 cameras in the optimum position for exposure and composition for the shoot, then lets you optimize the shot in post to reorient for the subjects. The filter includes a set of intuitive overlay controls that map each section of the 360 source clip to its respective face in the 360 environments, emulating the view that a user would experience when consuming 360 media via a head-mounted display system like Oculus Rift. Again, this control has a deep set of adjustments available to use, all grouped for easy access. The VR Blur filter generates out-of-focus effects by emulating the look of shooting with soft focus or a lens diffusion filter. Designed from the ground up to operate in 360/VR with multiple edge wrap modes to process pixels that reside along the edge of the 360 seam. (Non-VR aware filters will generate a hard line across the seam and will not create a convincing look.) 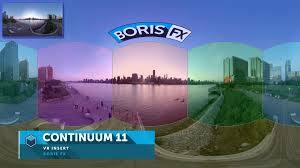 VR Blur includes independent controls for the amount of blur along the horizontal and vertical axis, making it easy to emulate fast camera pans. There has been a good deal of discussion about how you can direct your audience to watch a certain area, VR Blur is a wonderful way accomplish this. For my example, I have gone to the extreme with the blur but to be effective, you may only need a small amount of VR Blur to accent the area that you want to highlight and draw your viewers attention. VR Sharpen uses state-of-the-art image algorithms to enhance image detail while minimizing artifacts associated with traditional sharpening tools. The core sharpening algorithm performs up to four passes on Fine, Small, Medium, and Course pixel arrays, targeting physical details that have wider and wider pixel dimensions with each stage. Pixels, pixels and more pixels. It’s become the mantra of the day in 360 videos. But more pixels doesn’t always mean quality pixels. Using VR Sharpen alter either subtly or dramatically as you see fit. Once again, you the editor are given an almost infinite number of choices and controls for VR Sharpen. While you likely won’t need these everytime, they are certainly nice to have. Here is the complete list of what you can adjust with this filter plugin. Fine Detail Radius – Controls the radius of the finest sharpening band. Contains options to fine-tune the level of sharpness which is being applied to the image. Inter-band Radius Scale – Adjusts the radius of each band relative to the previous one. E.g. if Fine Radius is 2, and this is 1.5, then the 2nd band will be radius 3 (2 x 1.5) and so on. Sharpen Threshold – The starting threshold for the image sharpening algorithm. Values below the threshold are ignored by the filter which can help reduce unwanted noise or grit in some images, although this control can also introduce discontinuities in other images and should be used sparingly. Smoothing Control: Specifies whether the sharping is applied to all channels or just the luma channel. Luma – only the luma channel is sharpened. Independent Channels – each channel is sharpened individually. There you have it. The new BCC VR Unit adds some impressive tools for monoscopic and stereoscopic 360 videos. My favorite is definitely the VR Flicker Fixer, but all of them are great. 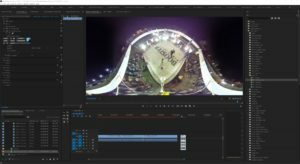 While Adobe products feature the almost identical toolset with the Skybox group of tools, Avid Media Composer, DaVinci Resolve, Nuke, FCP and Vegas Pro 360 video creators will definitely want to get these VR Tools along with the must-have Mocha VR.